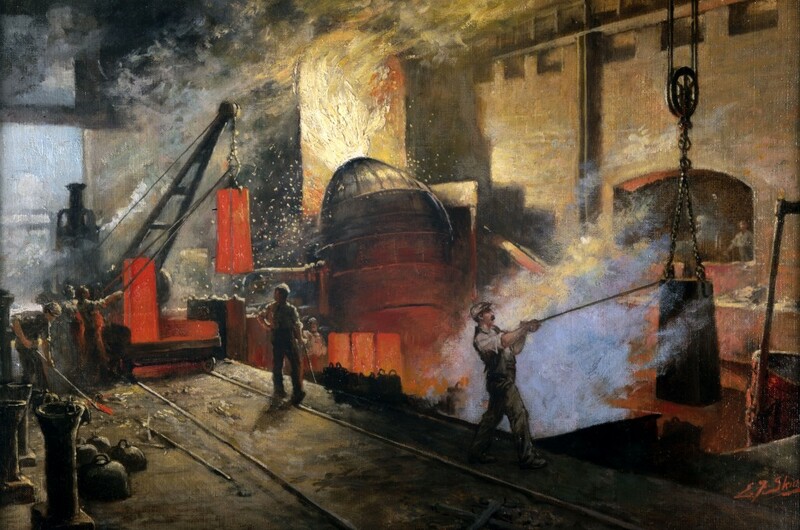 Oil painting by E F Skinner showing steel being produced by the Bessemer Process at Penistone Steel Works, South Yorkshire. Sir Henry Bessemer (1813-1898) invented a process enabling molten pig-iron to be turned into steel by a blowing air through it in a tilting converter. This was the first process for producing large amounts of good quality steel cheaply. 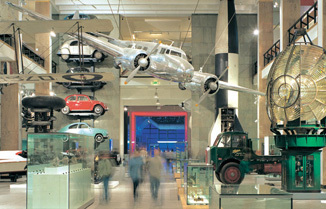 Previously, steel was available in small quantities produced by either the cementation or crucible processes. Hence engineers were restricted to using wrought iron, which is relatively strong in tension, or cast iron, which is brittle and weak in tension. Painted during WW1 as a commission from Cammell Laird, for reproduction as postcards to be sold in aid of the British Red Cross.